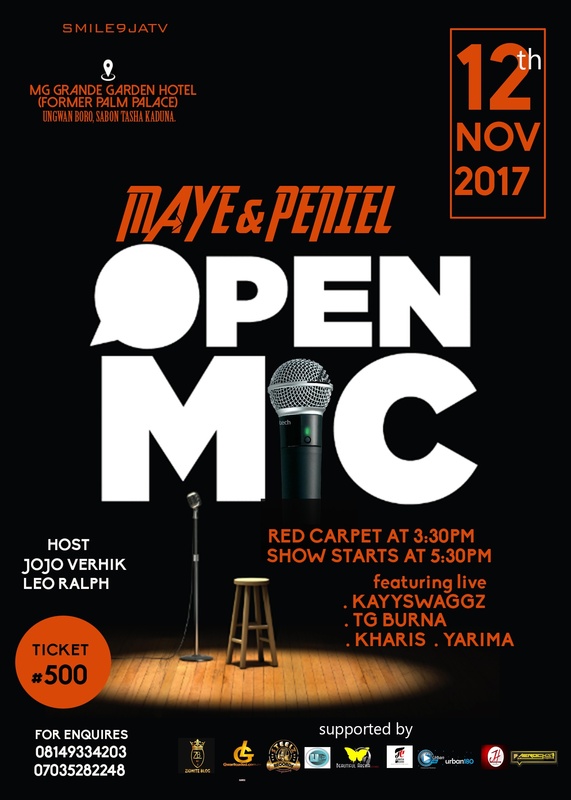 Smile9jaMedia House which is on a verge to be Launched on the 3rd December 2017, Presents "Open Mic With Maye and Peniel Live on stage " its a performance showcase featuring Original Music Artistry at its Best. On Sunday at MG Grande (Former Palm Palace) will indeed be an opportunity for performers and fans to mingle with 'Maye and Peniel' while showcasing their skills to an energetic audience. All A&R's, Label owners, Musicians, and Enthusiasts are welcome! This is an intimate and enthusiastic listening room. Both Maye And Peniel have an extensive experience performing in front of an audience, while to others this may be the first public gathering they’ve ever performed live and also to the world audience by which we mean YouTube LIVE Streaming , Instagram , Facebook and Twitter live Updates. This means No Recorded songs. No Public Domain Songs. Acoustic, Afro Pop, RnB, Hip Hop, Raggea, DanceHall, Afro Jazz.
" Live Freestyle Battle "